The image to the left here is from the men’s bathroom in the office of a friend of mine. 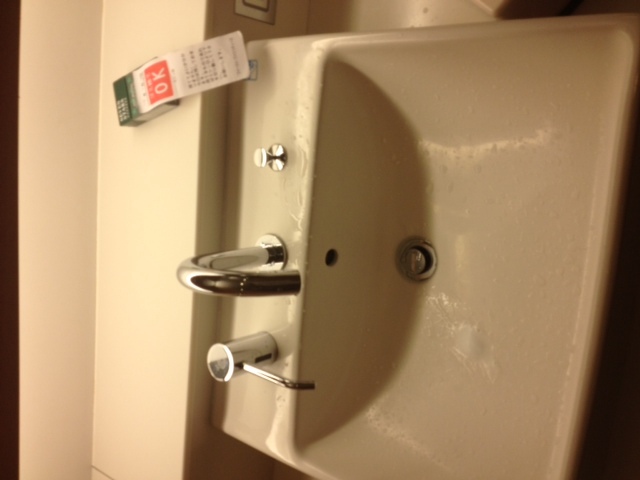 On the sink, just left sitting there, is a pack of cigarettes with a lighter inside. On the pack, the building cleaning crew has left a note. Loosely translated, the cleaning crew is asking if it’s okay to throw the pack away or if someone wants to claim it. The date of April 29th is at the top of the note, and it adds that if it’s okay to trash the pack, then tear off the bottom of the perforated note and the cleaning crew will trash it. After 1 day of sitting unclaimed, the pack will automatically be trashed. Think about this: someone actually has to tear off the bottom section in order to have the cleaning crew – or someone else – throw it away! This was clearly meant for use on larger office items, so as my friend asks, do you think someone might have a sense of humor?? My friend also points out, you have to think about the time people spent to design this system and then create the perfect sticky and perforated forms for it. Training for the cleaning crew was probably involved. I mean really – how does one decide what is just to be automatically trashed and what should be considered worth saving? It illustrates not only the cleanliness of the Japanese, but also the orderliness of the society. 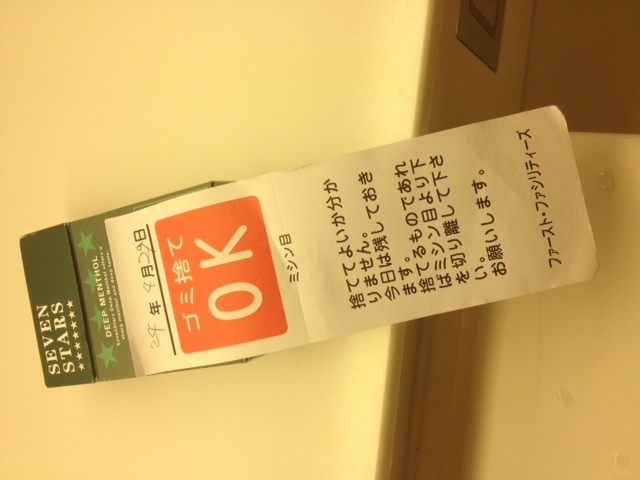 Where else but in Japan would you have the option to re-claim your lost cigarette pack and lighter? I’ve said it before: what a country!